We had a great seminar in Linz! Participants came parially from quite far to train with us in a concentrated, but relaxed atmosphere. Everybody brought some delicious food, so we had enough to eat in breaks. We all enjoyed lunch on the balcony, sitting together in the sun and resting a while for the afternoon program. At the end of the day, we had a lecture by Barbara and Ulrich about natural nutrition in harmony with the body. For dinner, we all went to a Chinese restaurant with enough time to have chats and a few drinks. 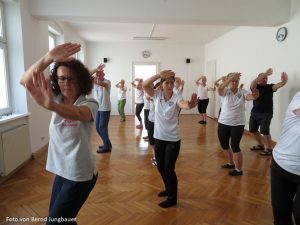 On Sunday, each of the training groups had another intensive lession befor Barbara and Ulrich showed us some very effective exercises to stretch and relax the body to (re-)gain a natural posture. Time ran out much too quick, but every participant got enough input for his or her personal TaiChi-developement. 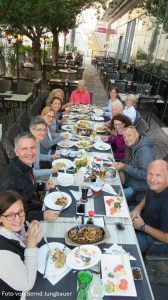 Many thanks to Ulrich Gössler, Barbara Kienzle and Marion Maag for organizing and realizing the seminar, Bernd Jungbauer for the fotos and everyone who brougth cakes or other good stuff, so that the seminar could be such a success!